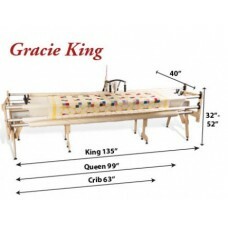 The Gracie King is our largest frame yet and can be set up in three sizes (crib, queen and king). It has height-adjustable legs allowing you to work at your ideal level, a fourth rail to keep your batting off the floor, and even a flip-up rail so you can easily examine and adjust the batting under your top quilt layer. Set of four bungee clamps. Fits machines with up to an 18" throat. Fourth rail to keep your batting off the floor. Movable bottom rail for quick access to your batting. Stability with the traditional beauty of a wood crafted frame. Can be set up in king (122"), queen (87")or crib (51") work areas. Height adjustable legs allowing you to work at your ideal level. Flip up rail so you can easily examine and adjust the batting under your top quilt layer.